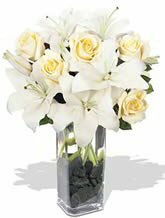 Elegant yellow Roses are teamed together with fragrant white Oriental Lilies to prepare this special bouquet. It can only be described as absolutely exquisite. 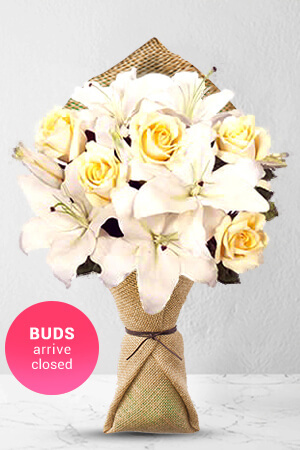 Vase not included however; if you wish to make a fantastic impression, may we suggest including a Superior Vase to your flower bouquet order? The flowers were beautiful and presentation in the vase made it all the more perfect. Same day delivery was very efficient. My daughter and son in law were amazed at them. I felt right about choosing your company - probably cause it showed there was a discount. The recipients of the flowers are delighted. Another happy customer. Happy as always with efficient service. Many thanks.